Bozteck VENM Remote Desktop Manager version 2016.5.4 has been released with more updates to our tabbed RDP interface as requested by an enormous number of our users. Announcing with version 2016.5.4, you can now reorder your RDP tabs in any way that you would like! You can also close individual tabs by clicking on the X in the tab title. 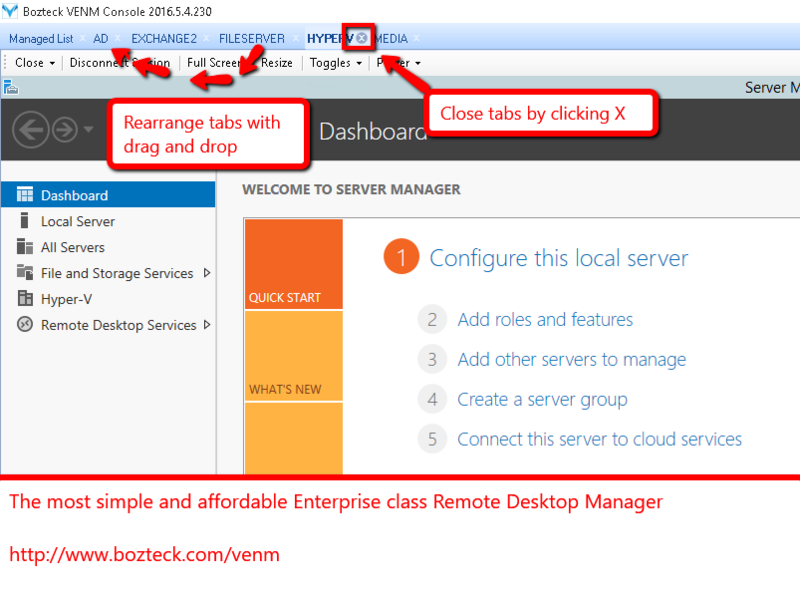 Bozteck venm is a remote desktop manager that focuses on simplifying your server and desktop management into a single console that is intuitive and powerful. VENM is the light weight Operations Manager for your entire network. Many features in VENM are direct results of feedback and suggestions from people like you. If you know of something that could be integrated into the console that would make your life easier as a System Administrator, please comment and let us know! This entry was posted in Announcements, Blog, vncscan and tagged bozteck, RDP, RDP Manager, remote desktop, venm, vnc, vncscan. Bookmark the permalink.